A Zone meal should contain no more than 400 total calories to help stabilize blood sugar and minimize inflammation in the body. Those 400 calories should contain at least 25 grams of protein, less than 12 grams of fat, and the carbohydrates should come primarily from low-glycemic choices. These carbohydrates should ideally be rich in fermentable fiber and high in polyphenols to balance the hormones in the blood. A perfectly balanced Zone meal should control hunger and fatigue for 4-5 hours by stabilizing blood sugar levels in the blood. 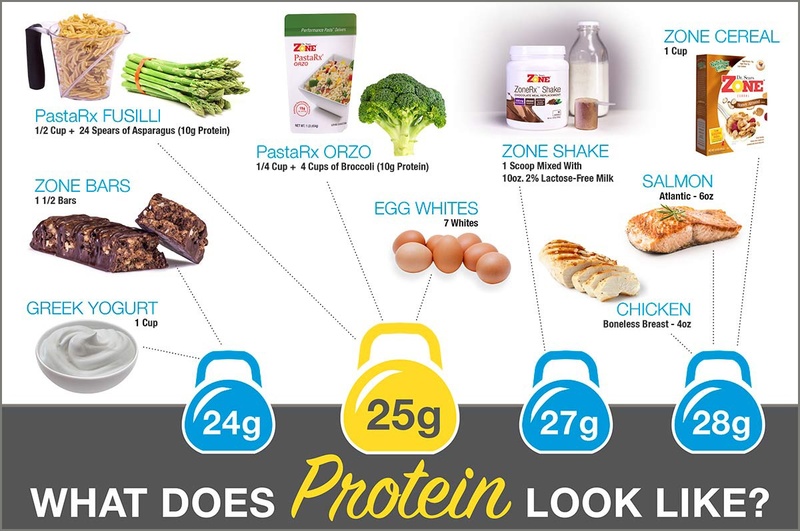 Here we’ll visually show you what that amount of protein can look like. Divide your plate into 3 sections. Use the “hand-eye” method to estimate the appropriate portion size of lean protein and “favorable” carbohydrates for your meal. A serving of low-fat protein should be about the size and thickness of your palm. The last thing to add before it’s truly a Zone meal – a small amount of “good” fat. “Good” fats are monounsaturated like olive oil or slivered almonds. Looking for a Quick Zone Meal? Try using our Zone PastaRx with a side of 2-3 servings of your favorite vegetables. Top that with a drizzle of olive oil and you are good to go! 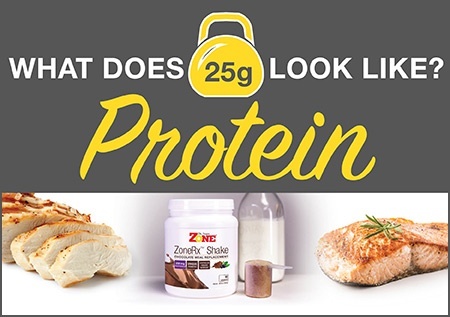 If your in a rush our ZoneRx Shakes and ZoneRx Bars are great for on the go. No time to craft a Zone breakfast? Grab a bowl, pour in 1 cup of cereal and add some milk - it's as simple as that.